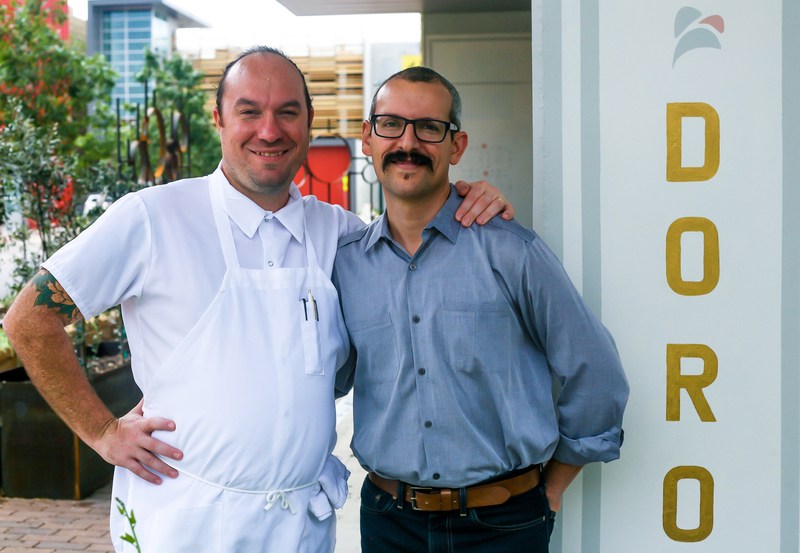 L’Oca d’Oro (The Golden Goose) is a celebration of community, locality, and the warm, simple connections that a great neighborhood restaurant should promote. Named for Chef Tedesco’s daughter, affectionately referred to as Lucy Goose, the L’Oca d’Oro dining experience is designed with family in mind. Free of performance and affectations, we offer gracious, inclusive hospitality and approachable reimaginings of hand-crafted Italian culinary traditions in a familiar, convivial setting. In true Italian fashion, our seasonal and prix fixe Dinner Series menus are an appreciation of regionalism. They feature our interpretations of dishes from The Veneto to Sicily, crafted entirely from ingredients sourced within a short radius of our kitchen door. Our pastas are made by our hands from freshly milled grains. Most of our bread, cheese, vinegars, and liqueurs are created in-house as well. Wine pairings for the season’s featured menus are available in flights, or our hosts will gladly help you select from our ever changing drink list. Our dedication to treating our farmers, their ingredients, our guests, our team and the local community with equal care is uncompromising. When you dine with us, you become—if only for an evening—part of a community of kindred spirits that is reviving the lost art of togetherness. Like many Italian-Americans, to Fiore, Italian cuisine is so much more than pasta and red sauce. It is subtle flavors, simple preparations, bold textures, and crazy-fresh ingredients, lovingly prepared and meant to be shared. These fundamental beliefs, nurtured in his Uncle’s deli, married seamlessly with his experience at New York City’s Gramercy Tavern, Roberta’s in Brooklyn, Franklin BBQ and Bufalina here in Austin, where he developed his palate over the last decade. He now brings his family traditions, experience and vision of gracious hospitality to life in L’Oca D’Oro. Having spent many years working in wine-focused, neighborhood restaurants in San Francisco and New York, Adam moved to Austin in 2009 and sought a concept that shared his ethics AND his love of food and wine. After a pause from restaurant life to teach film and be a stay-at-home dad, Adam found an opportunity with Fiore to help create warm, inclusive food and wine experiences in a values driven business, while maintaining his fierce dedication to a rich family life. After almost three years of hosting pop-up dinners, the friends opened L’Oca d’Oro, where Adam brings his experience and passion to the communal spirit of the restaurant’s dining room and bar. We proudly support Hausbar, Springdale Farm, Tecolote, F-Stop, Boggy Creek, Hi-Fi Mycology, Austin Orchards, La Flaca and other local farms for our seasonal produce, delivered daily. The lady birds at Milagro Farms supply our eggs, while our whole Mangalitza hogs come from Yonder Way farms. Fish is caught sustainably from the gulf and brought to us directly by the fishermen themselves with the assistance of Heritage Seafood.